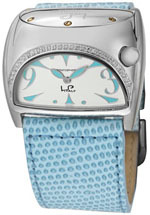 Lucien Piccard watches have an interesting history. The company was founded in Switzerland in the early 1920s, and quickly established a reputation as a maker of quality timepieces. Frank Sinatra famously wore one, and the company makes sure you remember that when you visit their Website today. These days, the company has moved in a somewhat different direction, positioning themselves as the maker of affordable Swiss watches. While Lucien Piccard watches can be found priced into the upper four figures, many of their models are more modestly priced. They offer a wide range of styles, from sporty to businesslike to fashionable, so it’s likely that you’ll be able to afford one and find one that suits your needs. If you want a famous name watch with decent build quality and you’re on a budget, you might want to give this brand a look. Read on for the full Lucien Piccard watches review. The build quality is good, but not exceptional. 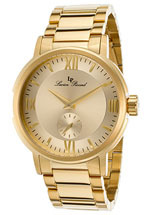 They use stainless steel cases for most of their models, though a few of their high end models have gold, as well. Their faces are covered by a glass called Sapphiretek, which seems to be relatively resistant to scratches. Water resistance is good, with some models being rated at up to 200 meters. The company also offers a good warranty and a better one than most. 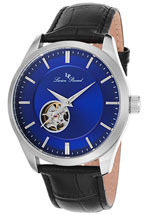 Lucien Piccard watches offer both quartz electronic and automatic mechanical movements. Part of the way the company maintains their relatively low prices is by making watches with movements sourced from Japan. That’s not to say that Japanese movements are cheap, as they’re not, but one rarely encounters Japanese movements in watches from a “Swiss” company. Still, that does allow them to keep the prices down, as Swiss-made movements do tend to cost more than those sourced from Japan. Either way, they’re reliable, accurate timepieces. Given that these are reasonably priced timepieces, you won’t see much innovation. These days, the company is more concerned with styling, and they do have some interesting looks to their product line. A few of their models have chronograph features and day and date complications, but for the most part, this company’s products offer the sorts of technical features you’d expect from pretty much anyone and without many surprises. The styling of Lucien Piccard watches varies from traditional to sporty to “out there” with a few models that offer some pretty edgy styling. Most of their product line, which consists of hundreds of models, consists of some variation on the traditional, 1950s style watch or a variation on the chronograph. They do have a few high end models with gemstones and gold, but most of their models seem to be styled with everyday wear in mind. As most of the models are made with quartz electronic movements, you won’t have to worry too much about maintenance, aside from replacing the battery every two years or so. Their models with automatic movements may require additional service every five years or so; please consult with the company for details on how to get your watch serviced. Aside from those considerations, you’ll want to store your watch away from extremes of temperature or strong magnetic fields. With proper care, you’ll find that your watch should last for years. 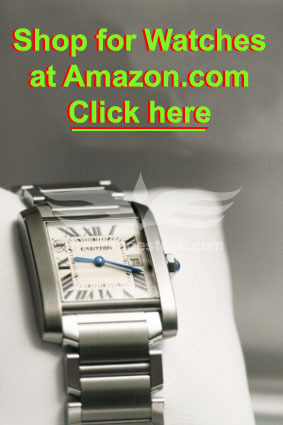 The warranty is quite good, and a great deal better than what is offered with most designer watches. The company warrants their product to be free from defects in materials and craftsmanship for five years from the date of purchase. This is much better than the standard warranty in the industry, which is usually for two years. We’d say that only about 10% of watchmakers offer a longer warranty, so this is definitely something to consider when you’re making a decision about whether to buy. You’ll find that prices are, on the whole, quite reasonable. List prices range from a low of about $295 to a high of roughly $7000 or so. We’ve seen them discounted quite a bit online, so you may wish to look on the Web to find the best price. Collectors do have quite a bit of interest in the brand, though they’re mostly interested in the company’s older, vintage models and less so in the current ones. On the other hand, these are very affordable timepieces, with the bulk of the product line priced at well under $1000 which makes them quite affordably priced for designer watches. In fact, we’ve even seen a few models offered for sale for less than $50. At that price, you can buy several. This brand isn’t hard to find in the marketplace; you’ll find them for sale at many department stores and a few jewelers. You’ll also find them for sale at a number of Internet retailers, and they likely represent your best opportunity to buy at a discount. As the company’s product line is huge, don’t expect any retailer to have everything in stock, but most sellers should have a good representative sample available. We’ve seen them heavily discounted online, so you should definitely start there. While Lucien Piccard watches aren’t quite the luxury items they used to be, the company still makes a quality timepiece and offers it at a good price point. The build quality is acceptable, the warranty is exceptional, and their styling and wide variety of designs means that just about anyone should be able to find one or more models that suit their taste. If you’re on a budget, you will definitely want to give this brand a look and if you’re feeling like splurging, you may find that you can afford to buy three or four Lucien Piccard watches. They’re attractive, affordable and come with a good warranty. That’s a nice combination in our book.